Merry Christmas to all the wonderful pie fans who read our Pierate blog! If there's two things you think of on Boxing Day, it's a full day's football fixtures and a good leftovers pie! Well for all our Football Pie Reviews, why not check out our Pieremiership Football League table! But for all those leftovers from Christmas Day, what better plan than to stick them in pastry and make a pie?! There are plenty of Boxing Day pie recipes out there, so whatever you have leftover from Christmas, we hope you find the right recipe for you! Partridge in a Pear Pie! You'll no doubt have heard the 12 Days of Christmas song, which concludes with the "Partridge in a Pear tree". But have you ever wondered what a partridge tastes like? Surely your true love would rather receive a pie, than a partridge in a pear tree?! Or better still, a Partridge in a pear pie? Yes... incredibly this pie does exist and we were grateful to Nice Pie for sending us one to rate this Christmas time! 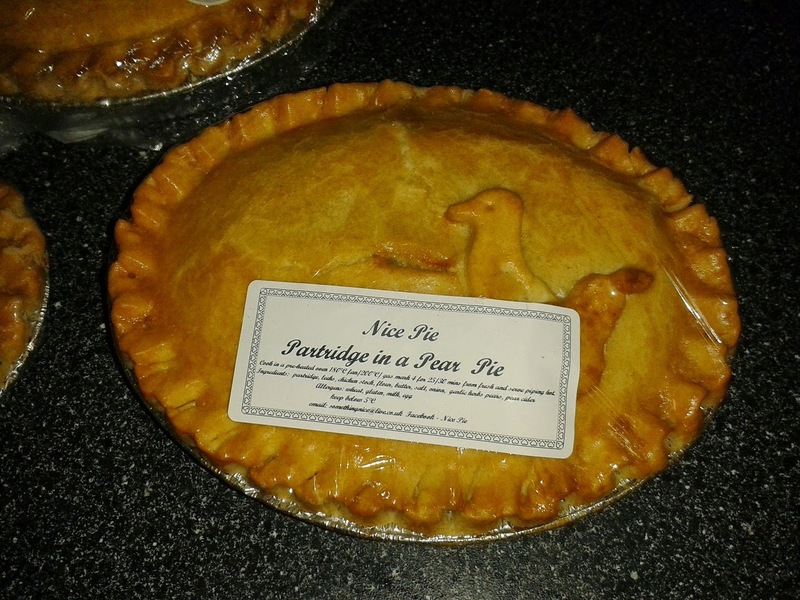 It certainly is a novelty flavour and you can find out how it rated in our Partridge in a Pear Pie Review. And if that ins-pie-res you, check out all the exotic Nice Pie reviews we have already done, including camel, squirrel and crocodile! Pie Tweet of the Week! The 'Partridge in a Pear Pie' certainly proved a talking point on twitter! We were delighted to once again be able to chat pie on BBC Radio's The Mark Forrest Show last week, having previously been on the show back in May! Listen in to the show on catch up here - with Pierateer Rob chatting pie with Mark for several minutes from 47 minutes in. Mark kindly called Pierate "one of the best websites out there" and recommended callers take a look and find out if their favourite pie was on our pie rankings list! Among other things, we discussed the Beef Bourguignon Pie at Manchester City FC - which rated very well - and the crocodile pie we had from Nice Pie.